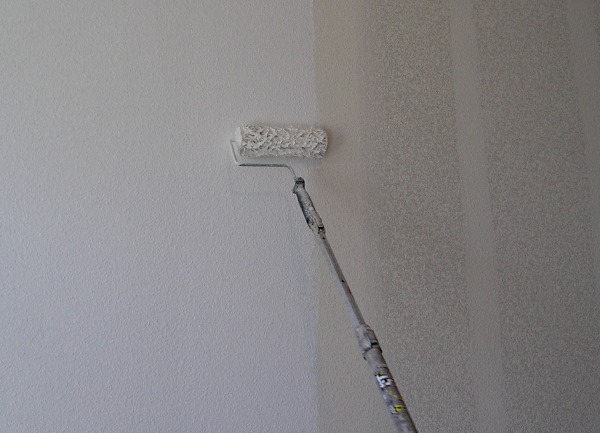 Applying drywall primer with a paint roller. Like most surfaces, new drywall needs to be primed before it can be painted. Drywall and joint compound absorb paint unevenly, so painting without priming first will result in an ugly, streaky surface. Using a special drywall primer will help you achieve a flawless finish. Ideally, you’ll want to prime and paint your drywall as soon as possible after the patches and seams are dry. Drywall paper has a tendency to yellow, especially when exposed to sunlight. This discoloration can show through your paint and ruin the finish. Primer for drywall has a very high pigment content. These solids don’t just provide an opaque surface; they also fill in pores and tiny imperfections in the drywall and joint compound. In addition, because primers have a low resin content, they tend to have a coarse or “toothy” surface- perfect for paint to stick to! On stained surfaces, special formulas can seal in discoloration and prevent it from showing through the finish coat. The type of primer you use is largely a matter of personal preference. Latex primers are easier to clean up and dry more quickly. They also release fewer VOCs than alkyd primers do. If you use a latex primer, you should also use latex (also called acrylic) paint. Many people prefer latex primers because they are so easy to use; two basic types will work here. The first is Universal Acrylic Primer, which is-you guessed it!-acceptable for use on most interior surfaces. The other option is a specialized drywall primer. Oil based, or alkyd primers, are more resistant to mold and mildew. They provide a good base for both alkyd and latex paints. On the other hand, alkyds have a stronger smell, are harder to clean up, and take much longer to dry. PVA (polyvinyl acetate) primers are water-based, but instead of acrylic, they contain acetate. These primers can be used with both latex and alkyd paints, dry quickly, and clean up with water. They are also good at sealing out moisture and odors. For better coverage, especially if your paint is a dark color, consider having your primer tinted. This will allow you to use fewer coats of paint, saving both time and effort. Make sure when applying your primer you follow directions. Don’t try to make the product go further by thinning it or applying a super-thin coat. It won’t work as intended. If budget is an issue, it can be tempting to cut corners by buying a low-end drywall primer. This can backfire, however. Cheaper brands are usually less heavily pigmented; it may take two or more coats of a low-end primer to achieve full coverage. On the other hand, a premium pva primer will contain enough pigment that only one coat is necessary. The bottom line is that while priming drywall may seem like an extra step, it is essential to the success of your paint job. Don’t cut corners- you’ll be glad you made the extra effort.